Trending at AU $122.34eBay determines this price through a machine-learned model of the product's sale prices within the last 90 days. It can be used to shade your eyes, repose, calm the mind and aid sleep. 1 x Silk Sleeping Mask. - Material: 100% Pure Silk. - Colour: Black. - With elastic strap to help you wear it comfortably. Never use direct sunlight to dry it. 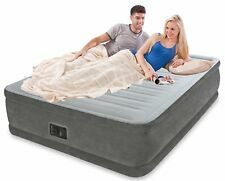 Bestway Air Bed Inflatable Queen Blow Up Mattress w/Built-in Pump & Travel Bag. 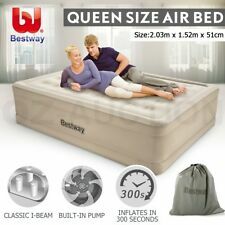 Enjoy a sound sleep all night long indoor or outdoor with thisBestway Air Bed Inflatable Queen Blow Up Mattress w/Built-in Pump & Travel Bag. Easy Fold stretcher Queen. Fully flat sleeping surface. 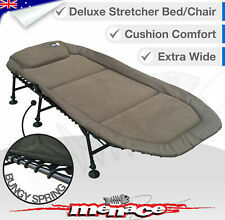 Designed to fit Queen Size Leisure Mats or air mattresses for a greatsleep combination. Hard wearing 600D soft touch fabric top. Greater comfort for tall people with no head or foot cross bars. Trending at AU $121.20eBay determines this price through a machine-learned model of the product's sale prices within the last 90 days. Camping Central. However we also accept bank deposit. Rugged 600 denier two tone polyester fabric. Opening Hours. Weight - 15kg. Weight Limit - 120kgs. Self-inflating single camping mattress with pillow. 2 x Self-Inflating Mattress. Colour: Blue, Green(randomly picked). Lightweight and easy to carry in its own carry/storage bag. Weight: 1.2kg. Change of Mind?. 1 X 100% Pure Silk Sleep Eye Mask. ★ S hade your eyes, help to relax and improve sleep quality. ★ Material: 100% mulberry silk floss covered in soft and smooth 100% finest silk both side. ★ New Comfort Design with Adjustable Elastic Strap. 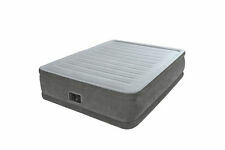 Coleman Quickbed Quilted Double Height Airbed. Coleman® Inflatable Airbeds feature our exclusive Airtight® System. What is the Airtight® System?. Queen Size. Powerful built in 240V pump to inflate and deflate. Will remain in a lofted state even with the valves open, no more waking in the night to a flat mattress. 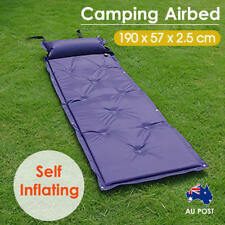 Self-inflating, simply open the valves and the mattress does the work for you. if the colour is advertised in the headingit will be that colour. Quality Intex Product. Includes Built in Pump. VALUE! Or even as a spare bed for guests. a soft suede top for luxurious comfort! Pick Up Is Not Available. The airbed has a very durable construction and. NOT SUPPLIED. Our Self Inflating Mattresses are Made from 210T PVC coated material with a high density Inner Sponge. Self-inflating single camping mattress with pillow. 1 x Self-Inflating Mattress. Microfibre Clean Step on Door Mat. Bestway Easy Inflate Flocked Air Bed Twin size Designed for comfort and convenience, sleeping under the stars is relaxing with Bestway Easy Inflate twin Sized Air Bed. Nobody enjoys the achy restless feeling waking up after a night camping with your friends and family. The SOL Escape Bivvy is nothing less than a revolution in backcountry shelters. With the Escape Bivvy, condensation is no longer an issue, and you never again have to choose between staying dry and staying warm. Separate fly sheet with large front awning. Easy Fold Stretcher Tent. The ultimate instant tent and bed for one. Dryseam™ factory taped fly seams for added water proofing. if the colour is advertised in the heading it will be that colour. Don’t leave anyone behind! Our specially designed “Swags for Wags” allow the whole family to enjoy the great outdoors in style. They can also be used around the house as an inside or outside kennel! 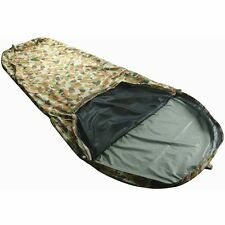 Folding Camping Bed Stretcher Light Weight Durable Camp Portable / Carry Bag camouflage. Military camp beds are available in blue green or camouflage. 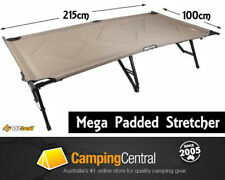 Folding camp bed Specifications Box Contains：1 x Camp Bed, 1 x Carry Bag. This stretcher size inflatable bed is 25%. Stretcher size: 200 x 71 x 15cm. or as a spare bed for guests staying over. 31 x 24 x 10 cm. Pump required: not supplied. Made of heavy duty PVC construction. Trending at AU $98.35eBay determines this price through a machine-learned model of the product's sale prices within the last 90 days. Self Inflating. Adelaide, Prospect. Tweed Heads. New South Wales. Perth, Midland. Western Australia. South Australia. Toowoomba, Harristown. Trending at AU $48.02eBay determines this price through a machine-learned model of the product's sale prices within the last 90 days. We hope that you are fully satisfied with your Kathmandu product. We use DHL for all our international orders. Check out how we get our amazing gear to you. Kathmandu Pty Ltd. Kathmandu eVouchers & Gift Cards. Trending at AU $141.11eBay determines this price through a machine-learned model of the product's sale prices within the last 90 days. OZtrail Comfort Bonded Mat 1100. Bonded top and base layers for a smooth, seamless finish and even inflation. if the colour is advertised in the headingit will be that colour. Coleman Foxy Lady Lounger Black. OZtrail Mitchell Expedition Double Swag. This OZtrail Mitchell Expedition Double Swag is an iconic part of Australian camping - the freedom you feel when rolling out your all-in-one shelter and bed cannot be beaten. SELF INFLATING PILLOW. Did you know this couples perfectly with our SELF INFLATING MATS?. Foam filled. Shaped so head is placed in the centre of pillow. The OUTBACK Inflatable Pillow. OZtrail Easy Fold Stretcher Queen. Designed to fit Queen Size Leisure Mats or air mattresses for a great sleep combination. Hard wearing 600D soft touch fabric top. Fabric: Hard wearing, durable 600D Polyester soft touch fabric. Outback Comforter Sleeping Bag. Soft touch flannel lining is great to climb into even on cold nights and the Outback Comforter is rated down to -5C°C. Design: Designed to be all the camp bedding you need in its own easy to carry bag. Oztrail Camp Mat Open Cell Foam Mattress. A high density 50mm open cell foam mattress to provide a comfortable nights sleep. Adventure Kings Self Inflating Mattress - King size. Adventure Kings Self Inflating Foam Mattress - King. The Adventure Kings Self-Inflating Mattress (Kings Size) adds a whole new level of comfort. 140mm thick, you won’t feel any of the stick & stones below. OZtrail Anywhere Bed Queen. Durable heavy duty PVC air mattress (pump not included). Air mattress sits securely inside a fitted FlannelTek™ pocket. Lightweight, easy to transport patented design that folds out to a queen size bed with built-in. A high density 75mm open cell foam mattress to provide a comfortable night's sleep. For larger swags, gives you even more room and comfort with a breathable polycotton top surface. Breathable poly cotton top surface. Time and again, spending time in nature has proven to be restorative for the body and the mind. What can compare to enjoying the serenity of a peaceful natural landscape, especially when accompanied by your loved ones? But, before you set out on your camping trip, be sure to check that you've equipped yourself with the necessary tools for a good night's sleep. What are Some of the Types of Camping Sleeping Gear Available Online? There are so many different types of camping sleeping gear available, it's almost overwhelming. But, camping sleeping options generally fall in a few specific categories. There are camping tents, sleeping bags and tent cots. As you can see, regardless of the specifics of your planned camping adventure, it's simple to find the right options for you and your travel mates online. What are Some Tips for Selecting Camping Sleeping Gear? There are a few factors you'll probably want to keep in mind when browsing for your new sleeping bag, tent and other type of camping equipment. For example, consider how often you will use your camping gear and how much durability you require. For example, if you're heading off on an ambitious camping trip or planning to explore rugged wilderness, you definitely don't want to skimp on the quality and durability of your supplies. Also, keep in mind if you are bringing a vehicle with you or if you plan to travel solely on foot. This will impact how many supplies you can bring with you; you don't want to suffer from an overstuffed backpack. What are some of the Other Camping Supplies and Equipment Items Available? If you're heading off on an intrepid camping adventure or simply want to equip your vehicle with helpful supplies in case of emergencies, you'll definitely want to peruse the array of camping supplies and equipment sold online. Just some of the items you may wish to consider stocking up on include: freeze-dried food, camping cookware, torches, portable camping toilets and portable showers. Don't forget to also browse the camping safety supplies either. It never hurts to have some quality medical supplies with you when setting out to explore the great outdoors.